Let me tell you about scraps. I cannot throw them away. I made my clothing since Jr High and my daughters clothing from the time they were born...and I saved the scraps and used the scraps. 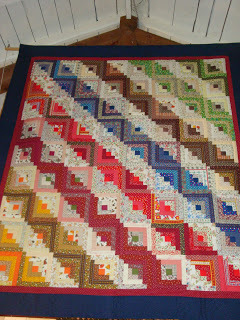 When I moved to Virginia in 1972, I was introduced first to quilting and later to patchwork. That was back in the Gorgia Bonesteel days. All I had was a book from Oxmoor House. I decided to make a log cabin quilt, but wasn't sure I wanted to spend a lot of money on fabric. What if I got halfway through the project and didn't like patchwork? I smile at the thought. I had a toddler and a baby on the way. I did not have any extra money. So I dug out my scraps. With a yardstick and scissors I cut 2 inch strips and sorted them into color groups and lights and darks. I love it because it is full of visual memories my little girls' favorite clothes. I did not buy any fabric until I got to the borders. I had read that the center of a log cabin block is orange or red representing the fire in the hearth. But when I ran out of red and then orange, I used green and blue and even brown. As long as it was a solid fabric, it could be the "hearth". I did not have enough blocks to do the "Barn Raising" setting that I had seen, so I set it in "Plowed Furrows". There were still scraps left. This past Christmas my girls got quilts made from the rest of those scraps. 3 1/2 inch scraps alternated with muslin. My friend Katheryn Crickenberger started the pieces maybe 15 years ago. Before she died, she handed me a bag with about five sections of piecing In August (2011) I pulled the pieces out and re-worked them into two queen sized quilts. The scrap saga goes on and on. I still save the leftovers. I always will. I have great ideas for using them. I will get to them. As I cut up the scraps left from a quilt or sewing project, the pieces bring back memories. Lots and lots of the best memories life has to offer.